This time I managed to take part in “Synchronbacken”. The girls had chosen a really gorgeous recipe: French Brioche! I’m a huge fan of the French fine bakery and Brioche were on my list for a really long time. So I did the dough on Saturday night after I came home from an acapella concert and actually it was quite late, when I finally went to bed 😉 On Sunday, I baked and photographed those beauties. As I’m really amazed by the result, I want to share the recipe with you today. So, let’s go! First, you have to dissolve the yeast in lukewarm water. Then you mix the flours and the sugar in a big bowl. Now pour the eggs and the water-yeast-mixture and let it knead for 5 minutes on low speed. Next, you add in the salt and let the dough knead for another 10 minutes. Cut the butter in small pieces and add it to the dough while kneading. When all the butter is in your bowl, let it knead for another 10 minutes. Now cover the bowl with a kitchen towel and let the dough rest for 2 hours at room temperature. After that you have to degas the dough. I opted for stretching and folding it on the floured countertop. Then you form it into a dough ball and put it back into the bowl. Cover it and put it in the fridge overnight. The next day you take the dough out of the fridge and form it into a square. Then you divide the dough in nine equal pieces and form those into a nicely rounded shape. Let them rest under the kitchen towel for 2 hours or until their volume has doubled. In the meantime you can preheat the oven to 180°C. 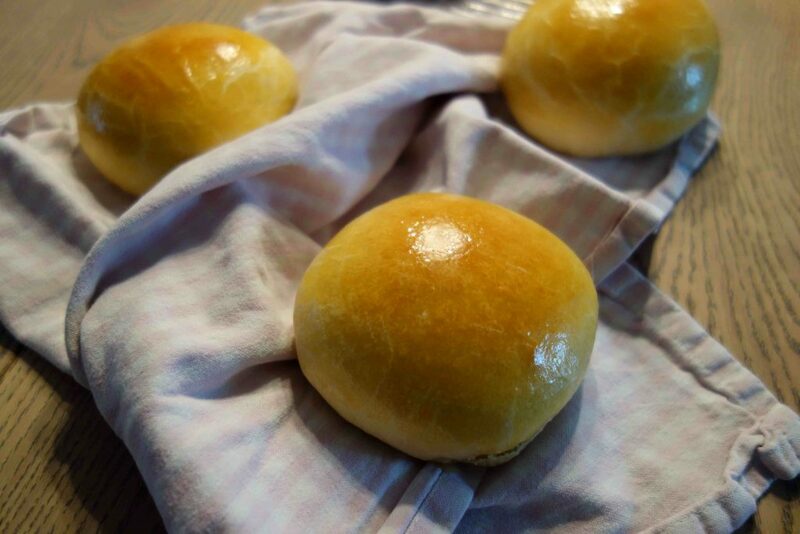 When the volume of the Brioche has doubled, brush them with the egg yolk and bake them for 15 to 20 minutes. Let them sit on a cooling rack for a while and eat them while they are still warm. They taste amazing with butter and jam, hazelnut spread or eaten pure with a cup of hot chocolate.